I might be trying too much to make a stance (Hairston has made 1 out of 12 threes after all) about a not-so important issue but people have got to quit blasting Hairston and demanding him to be taken out of the rotation. He might have played too many minutes (and that’s, that’s the freaking argument you make, not the one about him starting), however, there are other things wrong with this team which should be solved before the situation regarding Hairston’s starting position is tackled. First off, I have no problems admitting myself that I have not liked his defense beforehand. I wouldn’t have expected him to successfully track Kyle Korver around screens as reading them and staying focused off the ball have been his primary weaknesses. But coach Steve Clifford must have pulled a Jedi mind trick on him as he is doing his job of being the first unit’s defensive stopper diligently and even fared well against Korver. Moreover, according to Rick Bonnell, he will continue to get his chances as Clifford’s reluctance to start Jeremy Lamb or Jeremy Lin stems from not wanting to put an additional defensive burden on Nicolas Batum. In the last game against Atlanta, Hairston didn’t play fancy by going under screens and quite successfully tracked Korver through them, something you must do against a shooter of his caliber. His attempts of limiting and denying shot opportunities worked quite well as Korver was mostly taken out of the game. 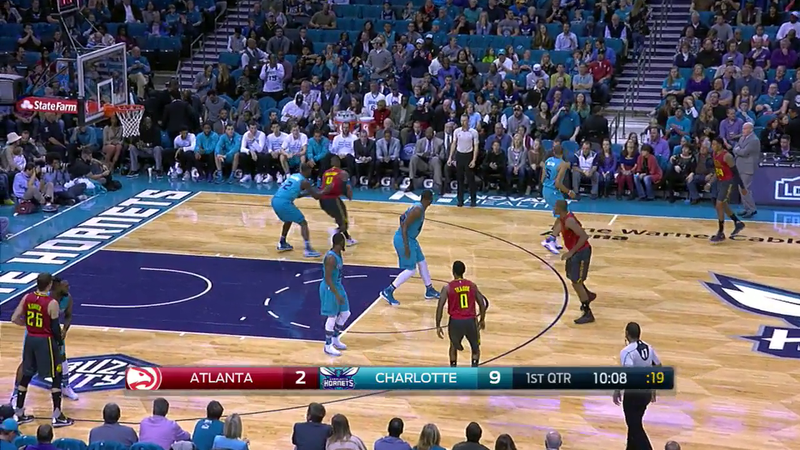 When Korver did in fact get in a position, which he considered good enough for a shot, Hairston got right in him to contest it. It’s actually surprising that the referees didn’t whistle him for a foul on any of these two following shot attempts or the previously visible shoves in the .gif image. I mean, this is about as much lower-body contact as a ref can permit on such a well-known marksman as Korver. It seems like Korver did notice his aggressiveness and kicked out the leg on the second attempt of the video on purpose, which only, by the looks of things, bothered his own shot. Why I do call this a “Jedi mind trick” is because entrusting Hairston with such a match-up bodes well for his off-the-ball thinking process. The mental mistakes have not been present so far and he’s ready to execute the fundamentals Clifford wants him to remember. Like, sprinting back alongside Korver to his favorite spot in the corner in transition and being locked in on a man, off whom help defense is moreso an after-thought. P.J. wasn’t on Korver in transition only once and that happened due to the fact that he got back the fastest and managed to shut down a lane for a fast break lay-up. His letup before the second shot might have cost us three points, however, I love the passion with which he went after Korver once he realized that and it resulting in him hitting Dennis Schroder (who might have gotten away with a moving screen of sorts, by the way) to contest the shot. What is significant about the times P.J. switched is that he mostly had his head in the play and was aware enough to do so. Yet the partner who did his end of the deal the best weren’t any of the veterans in Al Jefferson or Nicolas Batum, but, in fact, it was rookie Frank Kaminsky. Attaboys to both for reacting on-the-fly and switching seamlessly. As I wrote after the first two games, Kaminsky is ready to play. Some might come out and say, big whoop, he held a 12-point per game scorer to 6 points (on 3/9 shooting). Well, I have to point out that there’s a reason why Korver was an All-Star last year. Atlanta’s offense, the sixth best in the league last year (106.2 points per 100 possessions), was hugely propelled by Kyle. Whenever he was on the court it scored points at a rate which would have lead the league (110.8 points), while him sitting resulted in Atlanta (98.9 points) being comparable to our clogged toilet-offense (coined by Zach Lowe, 28th at 97.6) or the 27th best in the league. Even without Paul Millsap on the court the Hawks managed to tread water last season and be league average. That’s how much the threat of Korver’s shooting means and how much it can open up once he has received the ball. 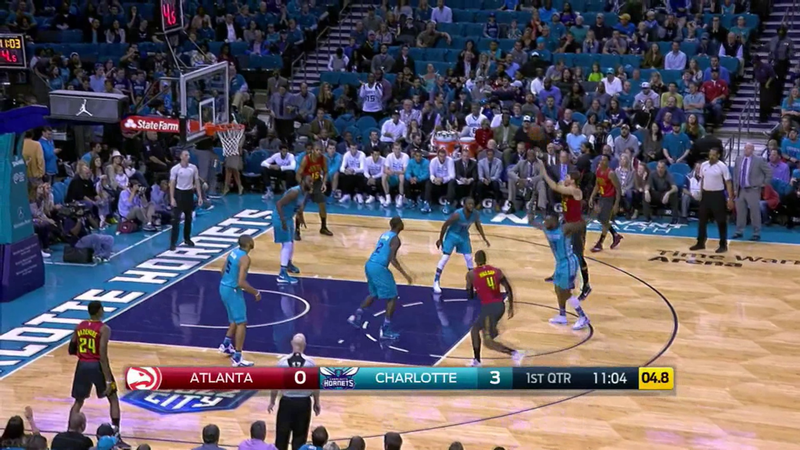 Just look at the great How U’s video of the Hawks “One” Play and the space Paul Millsap gets for his lay-up attempts once Korver has got the attention of both his man and the screen-setter. This body of work fits perfectly among the starting unit. The starters have so far out-played their counterparts in three games against legit playoff teams. Per 100 possessions, they have outscored their opponents by 19.5 points (113.7 – 94.2) in 38 minutes of action (additionally, they only gave up 93.7 points per 100 possessions in the last game, a testament to slowing down that Hawks offense). The bench unit has clearly been the problem as evidenced by them losing the lead all four times in the two games against Atlanta. So why should one wish for Jeremy Lamb to replace Hairston in the starting unit if it clearly has worked well and is clicking? If you rate Hairston as being the worse player and not good enough to be a part of the rotation then you are praying for a scenario (the scenario in question being Lamb replacing Hairston as a starter) where the bench unit is further weakened. In a way, we have found a way to utilize a player who didn’t show NBA-worthy production last season as he has actually contributed well to a good line-up. Moreover, the ones making this argument should understand that starting is quite overrated. One shouldn’t worry so much about what happens in the first minutes of the first and third quarter. Playing more minutes and playing in the fourth quarters are just more important. And with Michael Kidd-Gilchrist being out due to an injury, Hairston just has to get some burn. It might as well be with the starters as that has worked out fine so far and him being out on the court has produced a good result. Not to mention the fact that plenty of good teams in the history of the league have had mediocre players starting, while some of their real fire power is on the bench. I mean, look at Manu Ginobili‘s career. That being said, I’m not arguing against Lamb receiving more minutes than Hairston has. There is a solid argument there as Hairston has had an awful start to the season on offense and Lamb has provided a spark not only by shooting the ball but with some nice play-making in the last Atlanta game. However, I consider the argument about him not needing to start faulty. 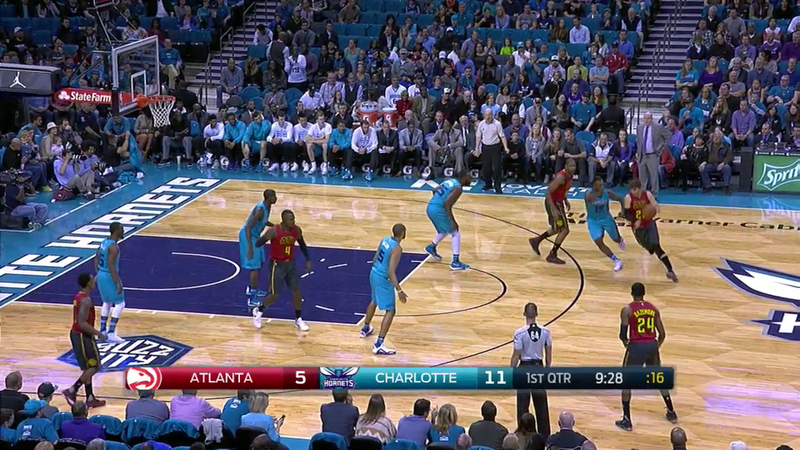 I would play Hairston for two seven-minute stretches in the first and third quarter. You might as well since those then are 14 minutes when a questionable player doesn’t hurt your team and actually has helped its cause in a way that the other two-guards on the squad probably are not be able to. As reported first by Marc Stein, the Hornets have come to agreement with Jeremy Lamb on a rookie contract extension worth 21 million in 3 years. First thing first, the contract is a real value deal. With the salary cap being about $90 million in the 2016-17 season due to the new TV deal, Lamb’s contract that year would be about 7.78% of the salary cap. Thus under figures and in a market which we are more used to the deal is more like $4.9 million per year (that’s the equivalent if it was a contract in the 2014-15 season when the salary cap was at $63 million). Moreover, if compared to the salary cap of 2017-18 (when it could balloon to $108 million), the percentage it would take up of the cap is even smaller. That is basically bench player type of money. Only in our case the bench player will enter the last year of his contract at the age of 26 and still has untapped potential. The bet is that the progress he makes up to his prime years will be significant enough and results in a great contract for the team. Additionally, if he does prove to be a two-guard good enough to start, his age aligns with Kemba Walker and Michael Kidd-Gilchrist, players in which the franchise has already invested in. These are salaries fans will just have to get used to. Bench spark plugs, possibly already past their peak, in Rodney Stuckey and Louis Williams signed the exact deal last summer. A similarly-aged guard, who also has been a career back-up so far, in Cory Joseph signed for $30 million for 4 years with Toronto. Meanwhile, the average starter is slated to earn between $13 and $15 million under the new cap. When compared with what the other teams have been spending, this isn’t an over-pay. Where this extension gets fishy is that it seems to be a Rich Cho-type of deal. Lamb has been on Cho’s radar for some time now, as reported by Rick Bonnell, and it seems only logical considering the GM’s Oklahoma City Thunder background. His previous draft picks created a team unable to create any kind of offense due to its spacing, something I’ve touched on previously. You can’t say that his draft strategy of going for young, athletic guys with great upside has worked out great. All due respect to MKG who we all love but even if he reaches his ceiling of DPOY-worthy player, there’s a huge chance that his offensive limitations will prevent him from reaching what a number two pick is projected to become. Cody Zeller‘s mid-range woes continue to be ever-present (he hasn’t made a shot outside of five feet during the first three games of the year) and for his career he might just become a third big playing minutes at the center position due to his speed. I seem to value his defense more than others, however, he’s yet to take a huge leap on offense. Now you’re adding another Cho project to the list and despite his potential he’s a guy who has played two regular season games for the franchise. That and a training camp has already sold the front office on extending him. It might have cost a bit more to sign him to a deal next summer. However, his NBA track record hasn’t been great, we have the management who might be the highest on him in the entire league and we ourselves are seemingly limiting him to about 20 minutes per game this season. Even if he does take away more minutes from Hairston eventually, Jeremy Lin‘s duo with Kemba promises to keep all of the two-guards on our squad as rather secondary players. Consider all of that and it seems unlikely that what you might have saved could even be more than a couple of million dollars per year. We might have even got him on the same deal. I don’t know how big of a part Michael Jordan played in this decision but the more Rich Cho was responsible for it the more his job could possibly be in danger in case Lamb doesn’t show enough promise. According to Zach Lowe, people might get fired if this season proves to be unsuccessful and, hey, guess what – I don’t see us winning more than 35 games. All in all, Cho better start hitting on some players sooner rather than later. The counter on “word play around the word Jeremy” is officially at two. We’ll see if the trend of noticing that Lamb and Lin have the same name continues on. I can’t decide whether his hot take about players taking games off is hilarious or annoying. Either way, his point was awful. Yes, it’s too bad that the new direction the league is in might prevent guys from being hurt. Let’s just rather over-play them. Collins called Marvin Williams (who has looked in awesome shape, by the way) “Marvin Harrison” twice during last game’s broadcast. Just proves that there is a little bit of Steve Martin in every Hornets play-by-play announcer. His enthusiasm makes me believe that he’s exactly the type of guy who will pump the TV audience up for a “possibility to start a playoff run” when we’re 25-35 and playing a lowly Eastern team on the road at March. It wouldn’t be fair to pile on the guy just because the last game he played was obviously very bad. But he can’t defend anything at the rim and I don’t see why Frank Kaminsky couldn’t do the same job he can. A Cody Zeller – Frank Kaminsky duo poses some defensive rebounding problems but then again who’s our lottery pick with noticeable talent and who’s the guy with a similar skillset in a center’s body who we traded for this summer for some reason. The changes I would like to see in the rotation, overall, are Kaminsky replacing Hawes, Hairston’s time on the court being limited to 14 minutes (the previously mentioned two seven-minute stretches) and us using the Walker-Lin-Batum-whoever’s played good-Zeller lineup more in the fourth quarter. Continuing the topic of the rotation, I think that the elephant in the room, which will rear its ugly head in the future, is Al’s place within this more three-point happy team (against the Hawks we recorded a new franchise record of 37 three-point attempts, yay). Possessions which are strictly meant for entering the ball into Jefferson are becoming less frequent and he has shot a horrible 30.4% (7/23) from the post so far. Does he complain if he continues to average around 12.3ppg during his contract year? Would he mind being left on the bench in fourth quarters as Clifford did at Miami? If we continue losing does he loudly voice his opinion that this three-heavy offense isn’t working as good as relying on him would? Jefferson was used quite little on offense in the fourth quarter against Atlanta. In such a case having him out there makes little sense, given his defensive shortcomings (of course, he ended up allowing the opposition two costly offensive rebounds). This entry was posted on November 2, 2015 by ReinisLacis in Charlotte Hornets blog and tagged Al Jefferson, Frank Kaminsky, Jeremy Lamb, PJ Hairston, Spencer Hawes.